Are you using Foxit PDF Reader? If yes, then you need to watch your back. The first vulnerability (CVE-2017-10951) is a command injection bug discovered by researcher Ariele Caltabiano working with Trend Micro's Zero Day Initiative (ZDI), while the second bug (CVE-2017-10952) is a file write issue found by Offensive Security researcher Steven Seeley. 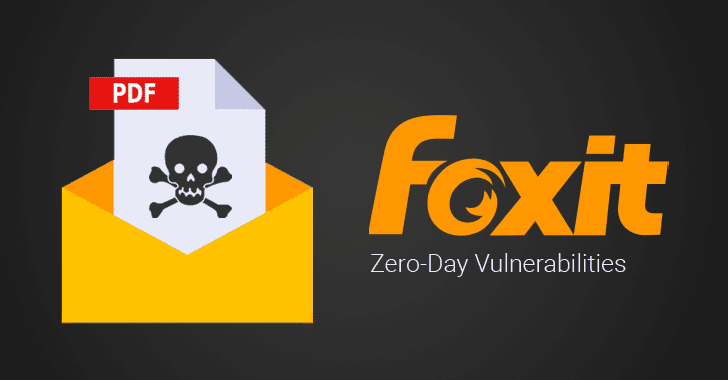 An attacker can exploit these bugs by sending a specially crafted PDF file to a Foxit user and enticing them to open it. Foxit refused to patch both the vulnerabilities because they would not work with the "safe reading mode" feature that fortunately comes enabled by default in Foxit Reader. However, researchers believe building a mitigation doesn't patch the vulnerabilities completely, which if remained unpatched, could be exploited if attackers find a way to bypass safe reading mode in the near future. CVE-2017-10951: The command injection bug resides in an app.launchURL function that executes strings provided by attackers on the targeted system due to lack of proper validation, as demonstrated in the video given below. "Steven exploited this vulnerability by embedding an HTA file in the document, then calling saveAS to write it to the startup folder, thus executing arbitrary VBScript code on startup," reads the advisory published by the ZDI. Users are also recommended always to be vigilant while opening any files they received via email. Just recently, we reported how opening a malicious PowerPoint file could compromise your computer with malware. So, always beware of phishing emails, spams, and clicking the malicious attachment. "Foxit Software is deeply committed to delivering secure PDF products to its customers. Our track record is strong in responding quickly in fixing vulnerabilities. We are currently working to rapidly address the two vulnerabilities reported on the Zero Day Initiative blog and will quickly deliver software improvements. In the meantime, users can help protect themselves by using the Safe Reading Mode." "We apologize for our initial miscommunication when contacted about these vulnerabilities and are making changes to our procedures to mitigate the probability of it occurring again."